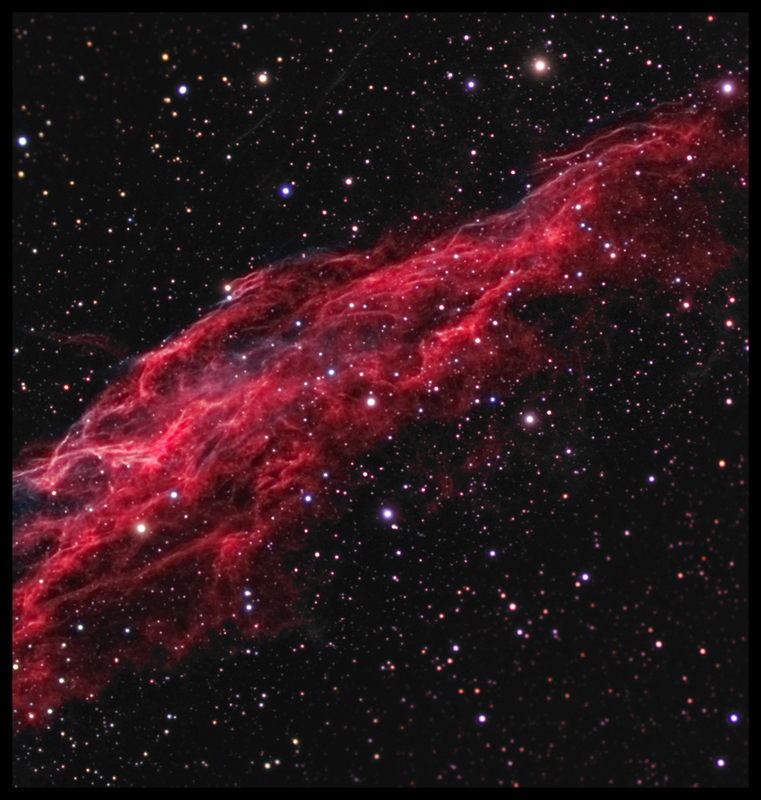 NGC 6992, also known as the 'Network Nebula', or 'Eastern Veil', is part of the Veil nebula complex in Cygnus. This is the most technically challenging image I've done to date, and is composed of 4 main frames, each comprising of Ha, OIII, Red, Green & Blue, a total of 19 frames (Ha was 3 frames). This meant that 5 separate mosaics using 2 different scopes were made, then registered using Registar, and aligned with Maxim. The mosaic sections were built using Maxim also. 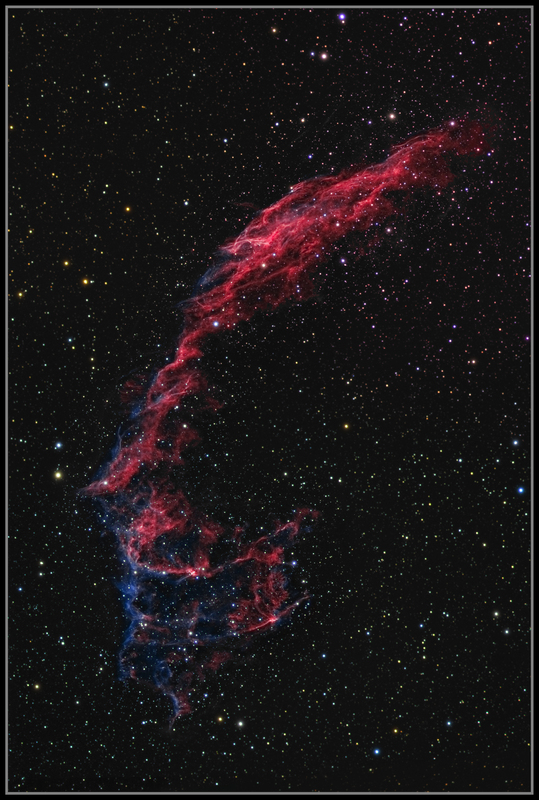 The Ha was captured using the TMB152 @ F8 with an SXV H16, and the OIII & RGB used a William Optics 80FD and Atik 16HR @ F6.9. The main nebula image is built up using an Ha luminance layer, Ha for red, Ha/OIII at 50% each for green, and OIII for blue. 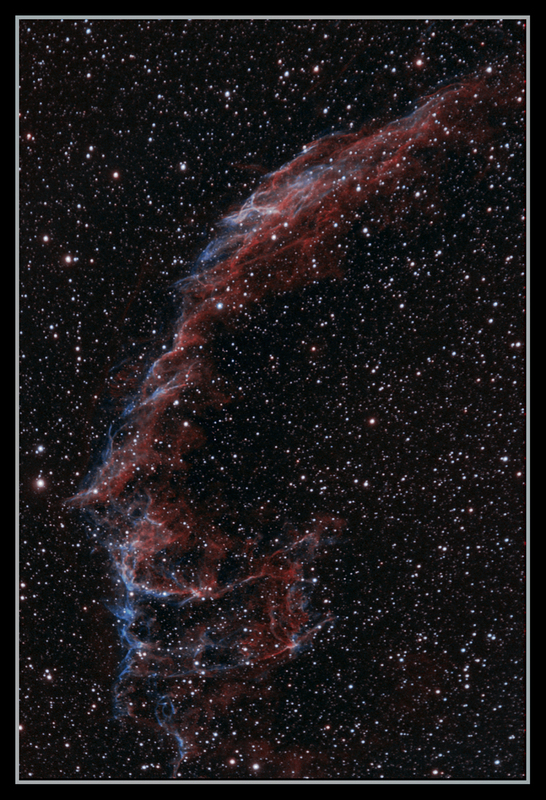 A star layer was created separately using the RGB data and added to the narrowband data then the whole of this was then dropped into the RGB star background and the narrowband data erased except for the nebula itself. Dual scope imaging isn't quite as straightforward as it at first seems, and with this image I had issues with my green subs being slightly out of focus, causing green halos, and some flexure with the WO scope. Also, as I'm using the 4 megapixel H16 image as the reference, and increasing the size of the 1.4 megapixel 16HR image to match, the 16HR RGB stars end up quite a bit larger than the H16 stars, especially as stars in Ha tend to be small at the best of times. Also, my flats were useless, so I initially had gradient issues between the different frames which have taken much head scratching to deal with. All a good learning process though. This is my first image of the Network Nebula, and was imaged on the 25th and 29th November(Ha) and the 9th December 2008(OIII). This is Ha (red), synth Green (Noels' actions) and OIII (blue). No luminance layer was used. I played around with the processing for about a week, and ended up with a very over-processed version, which I decided to scrap and start again. One side effect of pushing my original attempt at processing too far, was that I seem to have caught a 'bow shock, a shockwave from the original explosion. I've cropped this section and included it too, as I find it very interesting to see the red Ha shockwave, and right behind it the blue colour from the Oxygen. Imaged on several night during September 2009. Imaging time was 22 hours 36 minutes.